Holiday Essentials | Is This Mutton? The Greek style earrings, top left, were bought on the island of Hydra a few years ago. They only come out when I'm in Greece! The charm bracelet was purchased in Oludeniz, Turkey. The idea was that I would buy a charm every year. It didn't pan out, except for the pineapple charm which I bought in Hawaii. The charms are larger than usual and it's hard to find any of the same size. And now that Pandora and Trollbead type charm bracelets are all the rage, the bracelet looks a little bit....heritage? I try to avoid heritage jewellery at all costs. Very ageing! But I do wear it on holiday. I love the way it tinkles. 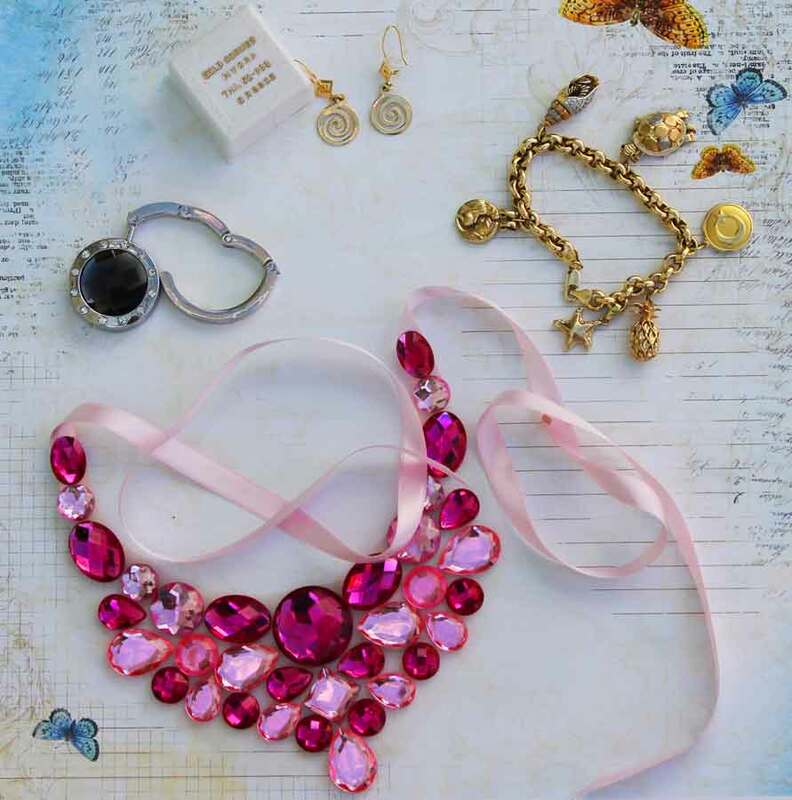 The pink necklace is a new purchase for this year from Etsy. The "bag dangler" (I don't know what you call them?) was a present from my friend Wendy and will be ideal for dangling my little evenings bags from the table in the bijou restaurants. I'm also taking a couple of new purchases from Guerlain's Terracotta range, which to me personifies summer. This year, a delicately perfumed body oil with a slight golden sheen, and a new coral cheek tint. Anyway, these are my favourite things that I will be wearing on Visible Monday in Greece! Lovely accessories. The necklace is beautiful. The colour is beautiful. Adorable. thank you for sharing this post. I really liked your post very much.